R.B. How, The Marketing System for Fresh Produce in the U.S. R.L. Shewfelt and S.E. Prussia, Challenges in Handling Fresh Fruits and Vegetables. S.E. Prussia and R.L. Shewfelt, A Systems Approach to Postharvest Handling. R.B. Beverly, J.G. Latimer, And D.A. Smittle, Preharvest Physiological and Cultural Effects on Postharvest Quality. R.L. Shewfelt, Measuring Quality and Maturity. R.E. Brackett, Measuring Microbial Quality. S.M. Fletcher, A.V.A Resurreccion and S.K. Misra, Measuring and Modeling Consumer Acceptance. C.N. Thai, Modeling Quality Characteristics. F. Bollen, S.E. Prussia, And A. Lidror, Visual Inspection and Sorting: Finding Poor Quality Before the Consumer. Y.-C. Hung, Latent Damage: A Systems Perspective. W. Tollner, J.K. Brecht, And B.L. Upchurch, Non-Destructive Evaluation: Detection of External and Internal Attributes Frequently Associated with Quality or Damage. R.L. Shewfelt, Stress Physiology: A Cellular Approach to Quality. A. Lidror and S.E. Prussia, Quality Managaement: An Industrial Approach to Produce Handling. S.M. Fletcher, Produce Marketing: New Techniques at the Supermarket. R.E. Brackett, D.M. Smallwood, S.M. Fletcher, And D.L. Horton, Food Safety: Critical Points Within the Production and Distribution System. S.M. Fletcher, Interdisciplinary Solutions to Postharvest System Challenges. 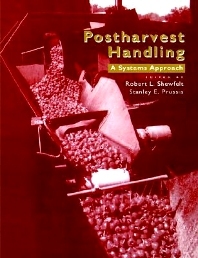 Postharvest Handling: A Systems Approach introduces a new concept in the handling of fresh fruits and vegetable. Traditional treatments have been either physiologically based with an emphasis on biological tissue or technologically based with an emphasis on storage and handling. This book integrates all processes from production practices through consumer consumption with an emphasis on understanding market forces and providing fresh product that meets consumer expectations. Postharvest physiologists and technologists across the disciplines of agricultural economics, agricultural engineering, food science and horticulture along with handlers of minially-processed products within the fresh produce fruit and vegetable processing industries will find this to be an invaluable source of information.